OK, I get it. Ritz is the King of Crackers (it’s alright, folks. I don’t have a cracker obsession, but my kids might). The flaky, buttery cracker’s—first introduced in 1934—have always been about wealth and glamour. 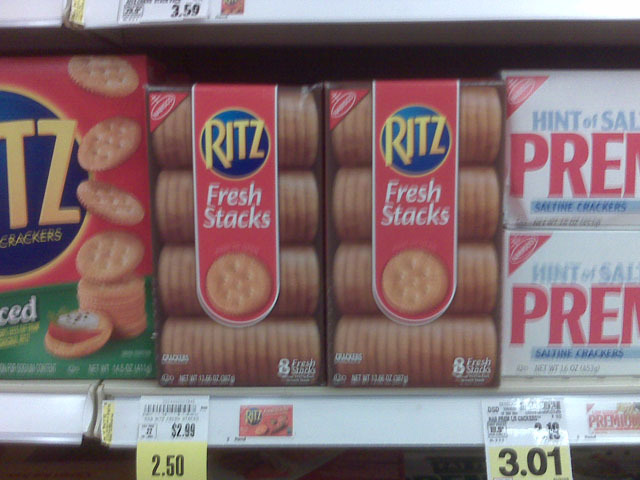 According to Kraft’s Nabisco, their #1 selling cracker was named after the Ritz-Carlton and can be enjoyed either by themselves or with a topping of choice. Certainly these salty snacks are familiar to most Americans. But how far can a cracker stretch without crumbling? Original, Low Salt, Reduced Fat, 100% Whole Grain, and Cheddar—Bits, Fresh Stacks, and Toasted Chips. How many offerings are needed? A recent article in BrandWeek and a trip to my local grocer spurred some observations. The cracker aisle—not unlike the rest of the market—represents a great deal of choice. But back to Ritz. This icon of the cracker aisle is seemingly balancing sub branded product variations for all of life’s events—dinner parties, school lunches, healthy snacks and decadent indulgences. So what is too much? Has Ritz diluted it’s glitzy heritage with Ritz Bits Sandwiches or does the historic brand find new relevancy with the next generation? Can a limited-edition, fudge-covered variety drive holiday sales? Will Euro RSCG’s campaign “Open for Fun” give the brand the typical 25% Super Bowl bump by leveraging Wyclef Jean, Guy Fieri and Tiki Barber? Do celebrity endorsements from the music industry in celebration of a sporting event align with the brand’s equity? Will a Facebook group and recipes with Boomer Esiason really attract a younger demographic? 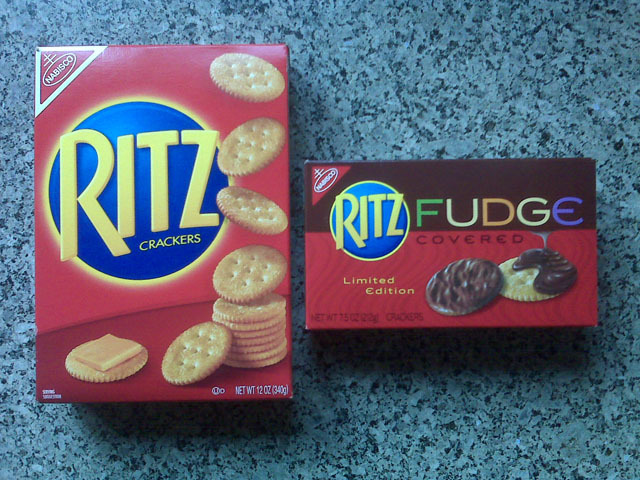 Is Ritz truly an “incredibly fun cracker” as stated in BrandWeek by Sheeba Philip, senior brand manager for Ritz? There was a time when you could pull up a bar stool and ask for a beer. Or buy a “pop” at the local 5 and dime. Or tell the attendant “fill it up” and not have to decide whether you should go with regular or high-test. Sorry – off on a tangent. 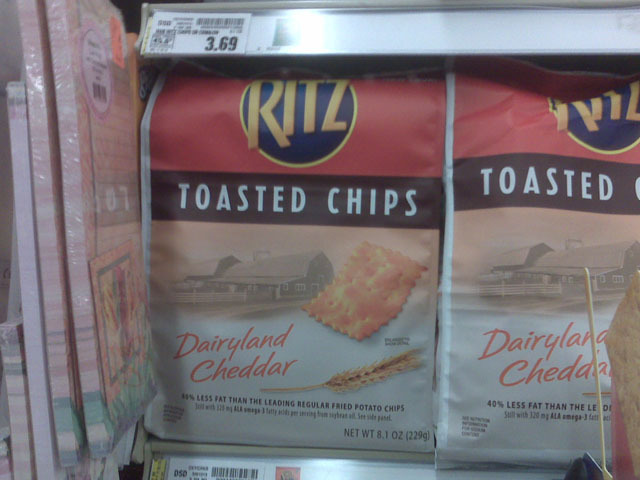 But the point is, when I think of Ritz crackers or any brand that I (as a consumer) am familiar with in it’s original form, my expectations about quality and taste profile (when speaking about brands I will consume as food/treat) are ingrained. At some point, I will make a decision about which of the line extensions I will want to try, or not, based on my own taste interests. Am I interested in Cracked Pepper and Olive Oil Triscuits? Personally, no. I just want a Triscuit so that I can add a slice of smoked cheese, or not. And, no, I don’t think that crackers are fun. I think crackers are a savory tweener when I don’t feel like having a confection. 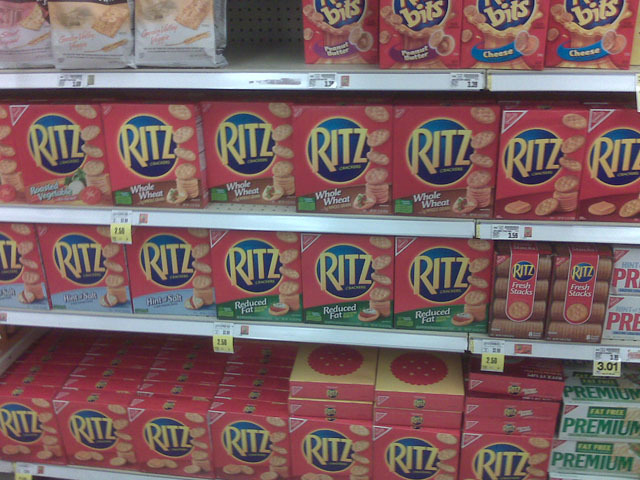 BTW: what percentage of revenue comes from Ritz Original? And, furthermore, do the extensions steal from the original? Personally I think that this is a question many Brand Managers asked themselves when facing the need to “give” shareholders an increase on quarterly results. My perspective is that while this kind of innovation might help increase short-term sales, the lack of focus will hurt the brand in the long run. You should balance a trade-off between having the right product for certain niches and being efficient in your product lines while having the focus of a “unique” brand. I also have always believed that this sort of innovation will disintegrate consumer cluster that buys one certain product because of brand image and habit, and not because that’s the product the consumer is wanting. Most of times a small brand in the same category is the one driving innovation by creating these niches. This could place a great weakness or threat to a brand (that doesn’t innovate) therefore only high value brands could wait this to happen prior to developing innovation. REMEMBER: As people change, so should brands/products. Having a cannibalization of your sales could be a good thing (if you’re bringing more money to the company). And not because of attending a certain niche you should give your focus away. A NOTE OF ADVICE: Consider manufacturing “IN AND OUT” products that attend certain niches for a short period of time. While this helps you get a burst in your sales and having a good “innovative image” on the consumers mind you and bind to maintain focus on your core-business. And if the I&O goes well… then you have a Line Extension. PS: I hope my English is clear enough.